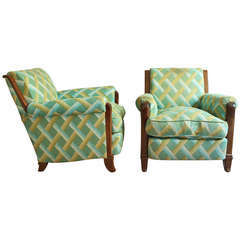 Unusual pair of French Art Deco armchairs with curved barrel backs and shaped fluted legs with rubbed gilt. The fabric is taupe/grey ultra suede. 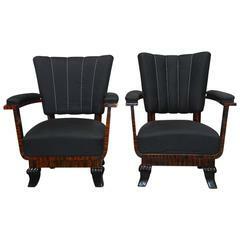 Seat Depth: 19", Arm Height: 25.25"
A pair of very comfortable Art Deco cubist armchairs. 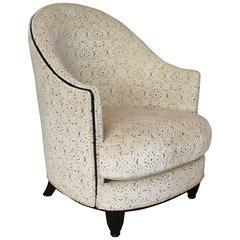 Reupholstered with a light brown beige velvet. French origin, 1930. 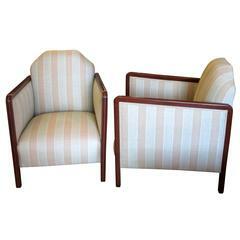 Art Deco barrel back chair with ebonized frame with contemporary cream upholstery and black piping. 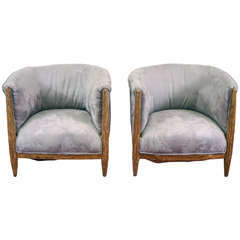 A pair of fine French, Art Deco walnut club armchairs. 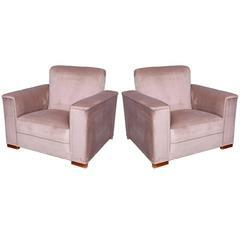 A pair of slender, deep seated Art Deco era club chairs. Geometric form back and continuous leg to leg wood trimmed arms.